Football books dealing with specific countries, and their idiosyncrasies, are awkward animals. They tend either to focus on one particular region or rivalry to the exclusion of all others, or to be obsessively inclusive. 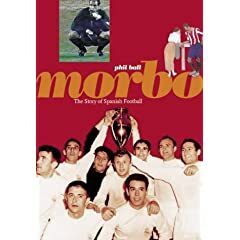 Phil Ball's superb Morbo: The Story of Spanish Football strikes, in my opinion, the perfect balance, and offers much else besides. It's no surprise that the book was published under the auspices of When Saturday Comes, one of the most readable and least self-important football publications in the English-speaking world. The author, Phil Ball, is a regular contributor to the magazine. For someone such as myself, who tended to see Spanish club football in rather simplistic terms (Real Madrid = Franco and the nationalists, Barca = Catalan resistance, Athletic Bilbao = ETA), the book is sure to be an eye-opener. Ball gently casts doubt on some of the accepted versions of the Spanish story (such as the oft-repeated assertion that Barca were unfairly robbed of the services of Alfredo di Stéfano, who came to virtually personify Real Madrid), while casting light on some of the fascinating early history of the game in the Iberian peninsula. He devotes a whole chapter to the club which started it all, Recreativo Huelva, now happily ensconced in La Liga once again. Ball is neither obsessed with statistical detail nor given to gushing digressions on "fan kulcha", and the book strikes, once again, a good balance in this respect. Also pleasing is the fact that the distant past is covered in just as much loving detail as the diverse present; Ball's research skills are impressive without the detail becoming oppressive. In his first chapter, Ball attempts to explore the meaning of the word in the title; although a morbo is, according to a Spanish dictionary, an illness, it is clear by the end of the book that the bug, whatever it may be, has sucked him in good and proper. Indeed, the tone is affectionate throughout, and the book is all the better for it...although perhaps this results in some of the more unsavoury aspects of the Spanish game, such as the racism of Real Madrid's Ultra Sur among others, being glossed over fairly quickly. I have to admit that I am a convert. Having been suckled on the particuliar milk that is English football, I am still moved by the strains of Match of the Day...but aesthetically and cerebrally, I am cured. The Premisership looks a crude offering indeed after the Spanish version, and the general gap in technique, fitness and tactical nous seems to me to be ever widening. Remind anyone of a certain Australian pundit? So speaking of football books, I finally started FOUL! on the flight back last night. I'm 150 pages in and it is indeed fairly scary but a very good read. Can't wait to finish it. I might give this one a go when I can. On a slightly related note, do you know by chance of any good books on the J-League? I don't, unfortunately. Maybe a bit too early in the history of that competition to have a book on it (especially in English).